When we talk to prospective customers about barns or stables in our Perth office, the subject of ventilation often leaves them at a loss. Those with cows and horses understand that ventilation is important, but often those who just use a barn for machinery don’t understand that their barns need adequate ventilation, too. Here is a look at the three main reasons that it is important to ventilate your barn: comfort and health for you and your animals, fire safety and building longevity. If you have cows or horses in your barn, the necessity for ventilation will be obvious. Their droppings alone will make any unventilated barn unbearable in short order. While many people install free stall barns to provide the ultimate in ventilation, we recommend a traditional Australian or American barn design because it provides more protection for your animals and your belongings. But why is it so important? You want to control both the air quality and the humidity of a barn to provide the healthiest living space. If the air doesn’t have enough humidity, it can dry your horses’ or cows’ nasal mucosa. This can also create dust that makes its way into your animals’ lungs. Air with too much humidity reduces the insulation factor of an animal’s coat, making them more susceptible to negative effects from temperature changes. Dust, gases from manure and airborne pathogens are dangerous to animals and humans. Dust can damage an animal’s respiratory system and is a source of airborne pathogens. Gases from animal waste, such as ammonia, methane and hydrogen sulfide can also damage lung tissue and can be fatal in high concentrations. Ventilation should always be efficient enough to keep concentrations of gases in the air to a minimum. It is also important that your horses and cows not be in drafty areas. Just like humans, they can suffer from the quick changes in temperature. A well-ventilated barn doesn’t need the doors to be open all of the time and controls air flow so that drafts are minimal. A poorly-ventilated barn allows too high a concentration of gases in the air. Often, flammable chemicals such as gasoline or kerosene are stored in a barn. In addition, animal waste creates methane. An open flame can cause an explosion in a poorly ventilated barn. In addition, poor ventilation can create pockets of intense heat, resulting in spontaneous combustion of hay or ignition of gases in the air. As we stated earlier, a well-ventilated barn doesn’t allow concentrations of gases to become so high as to be a hazard. A poorly ventilated barn can cause a lot of condensation as moist air rises and later cools. This is a perfect environment for moulds and other microorganisms that can deteriorate building materials. If you have a wood barn, moisture can quickly deteriorate materials and take years off of your barn’s life. 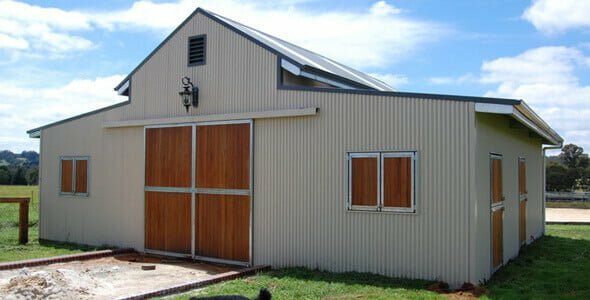 If your old barn is in a state of ill repair and needs to be replaced, you owe it to yourself to check out Action Sheds Australia. Our barns are made of BlueScope steel and we have a full complement of vents that can keep the air in your barn safe, healthy and comfortable for you and your horses or cows. We also offer Durastall stables, which are the standard by which stables are judged. All of our barns are ShedSafe certified. That means that we take a lot of safety variables into consideration during the planning process, such as your wind region, terrain category, topography factor and shielding factor. We then compute your site wind speed and make sure that your barn meets or exceeds those standards. We also provide a ten year structural warranty and a fifteen year cladding warranty. The end result is a superior barn at a lower price than building a conventional barn. It will be well-ventilated and sturdy, providing years of comfortable service for you and your horses or cows. To learn more, call us today: 1300 778 628.